Okay, it looks a mess, because, as is often the case, I didn’t think of taking the photo until I’d had a couple bites. This was one of my last cool morning weekend breakfasts of early spring. 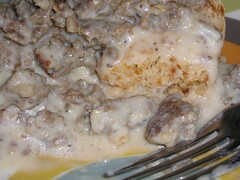 Every now and then I just have to have sausage gravy on a biscuit. And I’d found these little bags of Bruce’sSweet Potato Biscuit Mix at ShopRite. “The Breakfast Vegetable” it says – that’s pushing it! But let’s be frank, here, this is a processed food, plain and simple, and you know that going in. Ditto the sausage in a roll that I had.